The idea for this series of art came while I was driving from Iowa to Minnesota last fall. For about fifteen minutes I witnessed thousands of starling birds flying in the most amazing flocks. The flocks moved like swarms of insects or schools of fish and created the most interesting moving forms. I was inspired by this experience and started on a series of woodcut prints that depict these forms. To create these woodcut prints, I started with large pieces of veneered plywood and hand cut thousands of little marks. In the process of inking and printing these woodblocks, I noticed that the starling formations sometimes resembled storm clouds. They were beautiful and slightly menacing. 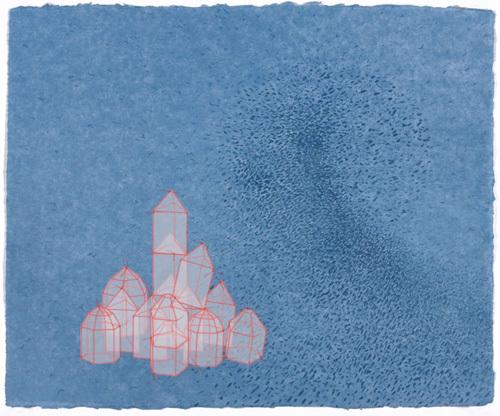 To protect the inhabitants that I imagined in these environments, I created little, translucent, geometric shelters and sewed them directly onto the prints. Some of the shelters stand alone while others are grouped into a community. If you look closely you can even see doorways uniting them.